Iowa Car Accident Standing to Sue | Hupy and Abraham, S.C.
Who can start a lawsuit after an Iowa car accident? Generally, the person who was hurt in a car accident because of someone else’s negligence has the right to sue the person who caused the crash. If the person who was hurt is a competent adult who survives the crash, then this rule applies. A parent or legal guardian may need to file a lawsuit on behalf of a minor child. Children do not have the authority to bring personal injury lawsuits on their own behalf. A guardian may need to file a lawsuit for a dependent adult. The legal guardian of an adult may have the authority to start a lawsuit for any injuries the dependent adult suffered in the crash. The personal representative of an estate may need to file a lawsuit on behalf of someone who died in the crash. If your loved one died with a will, then the personal representative is the executor of the will. If your loved one died without a will, then the personal representative will be the administrator of your loved one’s estate. The administrator will be named by the probate court. Typically, this will be the spouse of the person who died if the person was married. If the person was unmarried at the time of his death, then it would likely be his closest heir, such as a parent or child. If there were no heirs, then the court will name a different representative according to Iowa probate laws. Having the legal authority to start a lawsuit, which is known as standing to bring a lawsuit, is not the same as recovering damages. In a wrongful death case, the settlement or verdict that is recovered belongs to the estate and should be distributed accordingly. Additionally, any money that is recovered on behalf of a minor child or dependent adult is for the benefit of the child or dependent adult. 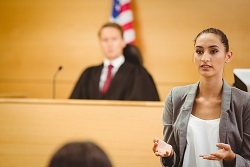 It is important to know who has standing to bring a lawsuit and how a case works before you file a complaint in court. If you have any question about your legal authority to file a case then please contact our experienced car accident lawyers via this website today.